You’re driving on a farm road somewhere in the Midwest. Suddenly, you hit a rut and sink six inches into the deep stuff. In a crossover, your chances of driving out of it are fairly slim. In fact, these popular vehicles (essentially, they are a cross between an SUV and a passenger car) have lacked the technical chops to control wheel speed, apply engine torque, and get you moving again. Improved models – the Ford Edge, Lincoln MKX, and Nissan Rogue – use liberal doses of technology to address those challenges. To test them, we took all three newly designed models on a winding dirt road, across a mud-caked farm field, and – just to make sure they handle well in a more typical scenario – on dry pavement at highway speeds. Surprisingly, each vehicle handled these driving conditions quite well, but with a slightly different experience. Read on to find out which one fared the best, and how they leverage tech to pry you out of the worst binds. Newly redesigned for the 2011 model year, and with a heftier 3.7-liter engine than the base model, the Edge Sport is a pure crossover: It handles like an SUV when you need the power but normally drives like a car for taking the kids to soccer practice and your daily commuter route. Ford has used accelerometers for stability control in previous models for years. These sensors can tell the speed of the vehicle, latitude and longitudinal position (aka, zig-zagging on the road), and the exact position of the foot pedal. What’s new for the 2011 model is that the sensors are now used for AWD control. Computer algorithms make fine adjusts in torque (e.g., the power provided to each tire) to make sure all four tires are working together to keep you going straight and smooth. Most earlier crossovers adjusted tire speed based on how the tires slip. They would back off power to, say, the left rear tire to keep the vehicle moving. By using stability sensors for AWD, the Edge actually senses slippage before it occurs. For example, the car senses whether it’s moving forward and the accelerator is only pressed down slightly. Then, if you press down harder to get out of a mud bath, the Edge prevents slippage: there’s an interchange between the speed of the tires and whether the car is actually moving forward. The AWD is also tied to the steering wheel sensor, so the vehicle adjusts tire speed – based on the steering accelerometer – in order to keep you moving straight. Okay, so how did all of this play out in our tests? First of all, the Edge Sport handled smoothly on dry pavement – it felt more like a car and less like a truck. In some cases, on especially dry pavement and around a curve, the vehicle still felt smooth and did not grip the road so tightly, which is common in vehicles like the Ford Explorer that tend to provide more grip no matter where you drive. In our mud tests, the Edge Sport started from an idle position in about four inches of mud, gravel, and water, accelerating evenly with only a slight fishtail movement. On a gravel road, the Edge never had any of the typical slippage that can occur – even at speeds around 50 MPH. Overall, the Sport lived up to its name, even if there was just a hint of fishtailing in the thickest mud. 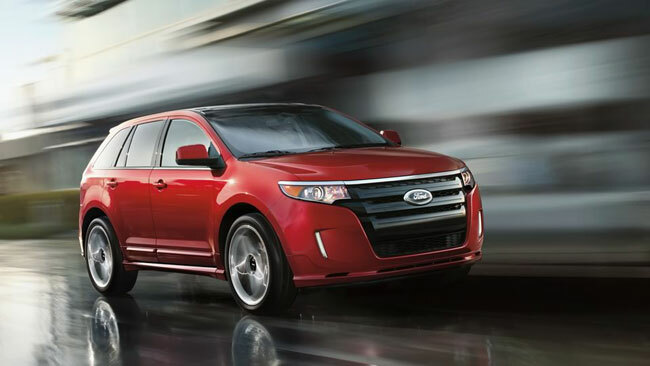 Check out our 2011 Ford Edge driving impressions. The 2011 version of the Lincoln MKZ is another total re-design – it uses the same powertrain as the Ford Edge. Interestingly enough, the handling is actually different from the Edge Sport and the Edge Limited, which we drove several weeks ago. Ford told us the MKX uses different algorithms for handling but otherwise uses many of the same components and stability sensors for the AWD. In the same test conditions, the MKX actually stayed a bit straighter and moved a bit quicker out of thick mud than either the Ford Edge or the Nissan Rogue. There was no hesitation at all, so it’s possible that the torque is applied for more of a robust feel when driving. Or, it could be that, at 5,420 pounds, the MKX is heavier than either the Edge Sport (at 5,174 pounds) or the Nissan Rogue (at 4,339 pounds). Around corners on dry pavement, the MKX also handled a bit less ruggedly than the Ford Edge, providing a smoother and more refined ride, which is to be expected since the MKX is positioned as more of a luxury vehicle. In the Edge and MKX, there are no settings for adjusting the AWD mode like there is on the Nissan Rogue (which lets you lock in AWD for better traction in mud). Overall, the MKX is a major improvement – the body styling competes easily with crossovers from Honda and even Mercedes, and the interior is well-made and nicely accented. 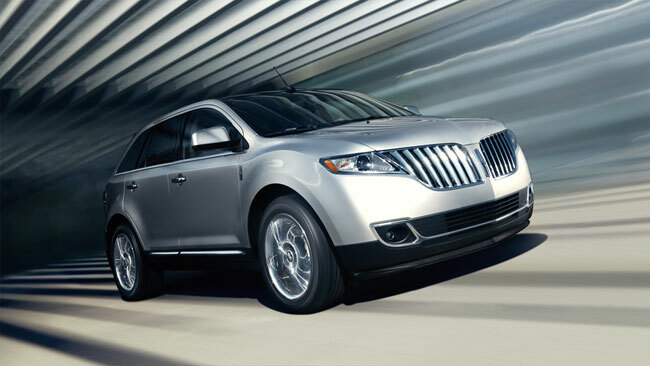 This crossover was our top pick for longer drives because of the smooth feel and intelligent AWD system. The Nissan Rogue is a smaller and lighter crossover than the Edge or MKZ, which makes it more fun to drive around tight corners and a bit more responsive in certain situations – such as making a very tight corner in a parking lot. Like the Volkswagen Jetta we tested recently, the Nissan has tight handling even on a gravel road. In our tests, the vehicle responded well to steering wheel movements and felt more precise than the Edge or MKX for basic around-town driving and on the highway. The Rogue is positioned as an entry-level crossover with a base price of around $20,000, whereas the Edge (at about $27,000 base) and MKX (at about $39,000 base) are positioned as higher-end crossovers. While the Edge and MKX can certainly handle off-road conditions, they are essentially passenger cars. The Nissan Rogue is still a passenger car, but in thick mud it behaved a bit more like an off-road truck. One perk on the Rogue not found on the Edge or MKX is an AWD lock button, which automatically allocates 50 percent of power to the front wheels and 50 percent of power to the rear wheels. It only works under 5 MPH. If you do not push the button, the Rogue will allocate power automatically. (The button is easy to find, but the light that illuminates in the dash is a bit hard to spot.) Like other modern crossovers and mini-SUVs on the market, the Rogue uses traction control sensors that apply light braking to a wheel that is slipping (while AWD adds power to wheels not slipping). The Rogue has a steering wheel sensor and yaw sensor (to see if the car is at an angle) that also add braking to the front tires to keep you straight. In the mud test, the Rogue actually slipped sideways a bit during a fast acceleration test from a standing position. There were a few minor instances when the tires felt like they slipped just slightly. For those who prefer a more responsive drive, the Rogue gripped the road tighter and more like an SUV, whether on mud or dry pavement. We ended up preferring the looser handling on the Edge and MKX for most driving conditions, but the Rogue was more fun to drive through heavy mud (even with the slippage).